In perhaps the most surprising move this season, the Toronto Maple Leafs decided to end the reign of Brian Burke as General Manager earlier than expected. It has been whispered for some time that Burke's tenure as the man responsible for returning the Leafs to glory may be on life support, but the news that Burke had been fired yesterday morning blindsided everyone. Personally, the replacement of Burke with Assistant GM Dave Nonis has already been tried once in Vancouver, so I'm not sure what direction MLSE is heading. All I know is that one of the best quotes in all of sports is no longer going to be giving quotes on a regular basis. 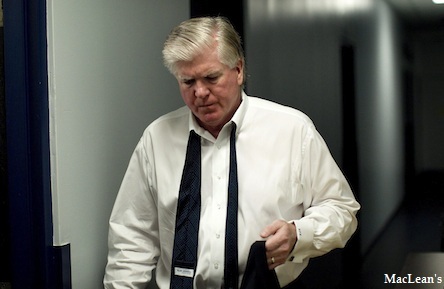 The one thing that I believe may harm the Leafs is that Brian Burke was an exceptional ambassador for the club while serving as the General Manager. Burke was an advocate for many community groups and charities, and was a prominent figure who spoke on behalf of these organizations. He regularly gave his time and effort to helping people from all walks of life through his association with these organizations. While I doubt Burke will pull up all roots and walk away from the groups he supports and speaks out for, his requirement to step back as the man driving the Leafs may also have him step back when it comes to his community involvement as a member of the Leafs. Some of the organizations that Burke was involved in include Big Sisters, Big Brothers, Covenant House, PFLAG (Parents, Families and Friends of Gays and Lesbians), You Can Play Foundation, and Canadian Safe School Network to name but only a few. He marched in Toronto's Gay Pride parades, and slept outside on the streets of Toronto to experience life on the street as a part of Covenant House. He has awarded medals to Special Olympians in Ontario, and has been involved with Special Olympics Ontario since arriving in Toronto. Needless to say, he has had a major impact on the city outside of the walls of the Air Canada Centre. Why was he let go? According to a report in The Globe and Mail by James Mirtle and Grant Robertson, the initial meeting between Brian Burke and executives of BCE and Rogers Communications didn't go well, and prompted the suits at BCE/Rogers to begin the process of removing Burke from his position. The report described Burke as "defensive and brusque – difficult to work with", something with which Kevin Lowe immediately agreed. Here's the key piece of the report by Mirtle and Robertson. According to a source in the room, Mr. Burke offered few solid answers for why the losses on the ice kept piling up. Nor did he explain why his four-year rebuilding effort had failed to solve two key issues for the hockey team: finding a first-line centre and stabilizing the Leafs’ goaltending situation. Executives of BCE and Rogers Communications, who together control 75 per cent of the sports franchise, found Mr. Burke defensive and brusque – difficult to work with, the source said. It was in that meeting that the early seeds of a personality clash were sown, sources close to Rogers and Bell said. Soon after, BCE chief executive officer George Cope, unsure that Mr. Burke was the right man to lead the team forward, began discussing a search for a new GM with his colleagues at Rogers. The decision would culminate in Wednesday’s sudden firing of Mr. Burke, who will be replaced by his long-time protegé, Dave Nonis. I'm not saying that BCE/Rogers made a mistake in firing Burke, and it should be expected that a man who has yet to lead his team to the playoffs after grandiose claims of restoring glory should have felt the noose tightly around his neck. But if BCE/Rogers is looking for a "yes man" to take the reins in Toronto, firing Burke seems like they are divesting themselves of someone who would have roadblocked the hockey decisions made higher up the food chain. I hate to point out that many of the successful teams have owners who are extremely hands-off in their handling of their franchises. Mike Ilitch allows Ken Holland to run his ship, and Detroit is the model franchise in the NHL. Likewise, Jeff Vanderbeek allows Lou Lamoriello to run the Devils without interference. Mario Lemieux and Ron Burkle handed the reins to Ray Shero, and that relationship has resulted in success. Jeremy Jacobs has given Peter Chiarelli more power, and the Bruins have seen dividends. I'm not sure what BCE/Rogers has in store for newly-appointed GM Dave Nonis, but it sounds like a lot of hockey decisions will be coming out of the boardroom if this trend continues. Nonis, who has only been with the Leafs since 2008 as "senior vice president of hockey operations" can't be absolved of the current mess that the Leafs find themselves in, but he's been handed the reins to try to right the good ship Toronto. Whether or not that happens remains to be seen, but Nonis will be under the spotlight for a while. Here's hoping that BCE/Rogers is more hands-off going forward so that the Leafs can finally break the streak of being the only team not to make the playoffs since the previous lockout. And here's hoping that Brian Burke, newly-appointed senior advisor, will continue to have a lasting impression on the organizations with which he's associated.